This month I hope to inspire you to crown yourself with flowers. It’s a wonderful way to bring out the Goddess within. Flowers are also a sign of fertility, quite in keeping with Beltane, making this a perfect time to start. In most areas, plants are just beginning to bloom. As I write this in central Connecticut towards the end of April, forsythia is just about to peak while daffodils are waning. Grape hyacinth and early tulips are just starting to bloom, and crab apple and a few other bushes and trees are just starting to bud, so it won’t be long. We have vetch and Hebit everywhere. Pansies are flurishing and violets, toothwort and marsh marigolds won’t be far behind. With some luck, perhaps even wild phlox and wild red columbine will bloom. I suggest harvesting what you have growing locally – including flowers, grasses, weeds and branches – without it being detrimental to the Mother, and supplementing as necessary. I have a “thing” about artificial flowers making for an artificial experience, but if that’s not you, by all means, take advantage of the selection at craft stores. Pick with stems as long as possible. If not using immediately, keep in vases in a cool place. 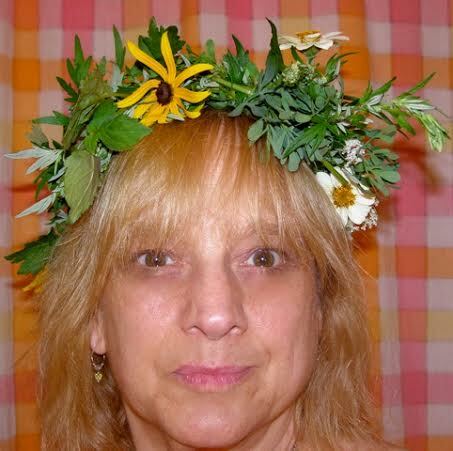 There are several ways to fashion a head wreath. Starting with a frame is helpful, but not required. A circle of craft wire works, as does a pliable stem (real or artificial) that you form into a loop and secure. Two pipe cleaners can be used to form a circle, and then additional pipe cleaners wrapped around them to strengthen it before decorating. Check to be sure it fits the wearer’s head before proceeding. Gather several flower stems together and place them on the wire, blooms facing up and out. Wind the stems around the frame and secure with twist ties, pipe cleaners or florist tape. Take the next several flowers and put them slightly behind the first set, overlapping stems, wrapping them and securing in the same fashion. When stems are not easily bent, try wrapping a pipe cleaner, wire or florist tape around a few at a time, and then securing the small bouquet to the frame. Ivy and long grasses can cascade from the wreath. Continue until the frame is covered. Adding ribbons to the back is a nice touch. Much like French braiding hair, I have also braided stems in such a way that every time you cross over a stem to braid, you add another flower. Tutorials can be found online. Several years ago, I wove a wreath from grapevines and have been using it since, weaving flowers into the spaces of the wreath. If working with artificial flowers, it’s fairly easy to bend the stems around the base, twisting a few together first if they are small. 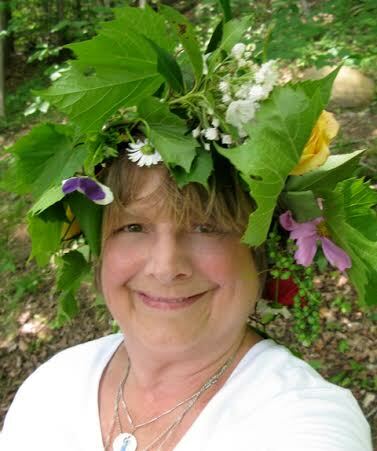 Flowers – real or not – can also be secured to a plastic headband. There is no need to over think the project. Any way you can fashion flowers into a circle that can sit on your head will work. The key thing to remember is that the flowers are beautiful, so there’s no way your crown can be anything but beautiful. If you like your first one, consider making one for each of the coming sabbats, using seasonal blooms and colors. Note that the two pictured both happen to be from Lughnasadh and are woven without a base and without a frame.